A wave of victories against extremists should have seen civilian life slowly return to Iraq’s liberated cities. Instead there’s chaos and nobody knows who’s in charge. What kind of forward planning does the government have in mind? The cities from which Iraq’s pro-government forces have expelled the extremist group known as the Islamic State are in a state of administrative chaos. Cities like Atheem, Jalawla and Sadiya,in the Diyala province and Tikrit, Dour and Albu Ujail in the Salahaddin province are sites of some of the most important victories for the forces fighting the Islamic State, or IS, group. Yet there are little or no signs of a return to civilian life in these places. 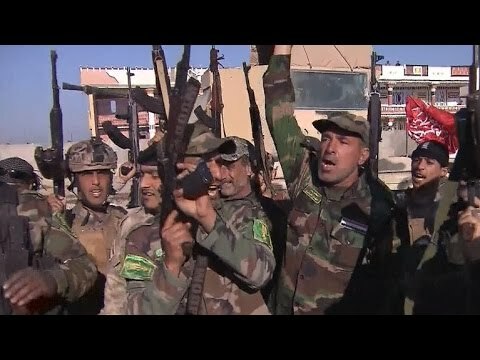 There are no local police, courts or state services and the cities have tended to remain under the rule of the unofficial Shiite Muslim militias that took part in the battles to free them – the militias are mostly made up of volunteers and are not under the control of the Iraqi government. And many of the cities used to have Sunni Muslim-majority populations. Many of the latter are too scared to return to their homes while members of the other sect are in charge; in fact, some say the militias won’t actually allow them to return. The various abuses that some Shiite militia fighters have meted out in retaliation for what they see as Sunni collaboration with the IS group, which bases it’s strict religious ideology on an extreme form of Sunni Islam, have been well documented. The question that remains though, is what happens now? Since September 2014, the Iraqi government has actually been holding talks with armed Sunni Muslim factions such as the Mujahideen Army or Jaysh al-Mujahideen and the 1920s Revolution Brigades as well as with certain Sunni Muslim tribal leaders opposed to the IS group. Negotiations took place discretely in places like Erbil in northern Iraq, in Jordan and other Arab countries. However there were no concrete results and in February many of the Sunni Muslim factions and tribal leaders announced they wouldn’t enter into any kind of alliance with the Shite-Muslim-led government, headed by Prime Minister Haider al-Abadi. Prominent among the groups who say they won’t cooperate are the Association of Muslim Scholars of Iraq, the Islamic Army in Iraq, the General Military Council of Iraqi Revolutionaries, the Supreme Command for Jihad and Liberation, the council of Anbar’s tribal leaders and another council representing Ninawa’s tribal leaders as well as another extremist group, Ansar al-Sunna. These armed factions from among Iraq’s Sunni Muslim populations command influence and respect in Sunni Muslim areas because they are seen as protectors of the population and because they did not enter into, or remain in, an alliance with the IS group. Another way that the Iraqi government had hoped to enlist the aid of local Sunni Muslims was through the formation of a so-called National Guard, which would effectively allow locals to form their own military units and police their own areas. The National Guard would have been able to fight alongside the regular Iraqi army and possibly even the Shiite Muslim militias, helping to expel the IS fighters from their cities. Then afterwards the National Guard would be tasked with overseeing security in those areas while the other forces withdrew. This would effectively prevent the IS group, which played upon unhappy, popular Sunni Muslim sentiment, from returning. But none of these plans have come to fruition. The al-Abadi government doesn’t seem to have any reasonable or powerful contacts within the cities that have been liberated that could help in the long term and, in the short term, logic dictates that if the Shiite Muslim forces withdraw the IS fighters will return. Maintaining control over terrain once the IS group has been expelled requires a large military force to remain there until local security can be arranged. But doing this reduces the chance to fight the IS group and keep winning back territory. It also gives the IS group more time to organise sleeper cells that can move undetected through the local population and launch attacks on pro-government forces and locals. And the longer the mostly Shiite Muslim forces stay in mostly Sunni Muslim areas, the more opportunity there is for revenge attacks and persecution of the civilian population, which again, will complicate matters even further. What is missing right now in Iraq is forward planning – if the Iraqi government could send in pro-government forces, re-take terrain from the IS group and then swiftly leave again, handing responsibility over to some kind of National Guard, then there’s no doubt ordinary Iraqis would be in a much better position to savour this wave of victories against the extremists.